In 2011-2012, I supported the Township hiring a nationally recognized outside economic modeling firm to conduct a comprehensive incorporation cost impact study. Their report concluded that near-term incorporation would increase our Township property taxes by 70.4%. In 2016, our own Township staff conducted two new incorporation impact updates. Both staff studies concluded that under the best case scenarios our property taxes would increase by a minimum of almost 50% if we incorporated in the near-term. By state law, we can incorporate any time between now and 2057 to avoid annexation by Houston and Conroe. The Regional Participation Agreements between the Township and both Houston and Conroe were entered into pursuant to the express authority of Section 43.0754, Texas Local Government Code which provides in subsection (l) that any such agreement is incontestable in any court in Texas. While the Texas Legislature may amend or repeal this Section at its discretion, it cannot invalidate these agreements or rewrite the historical fact that the agreements were duly made under this legislation without violating federal and state constitutional prohibitions against legislative impairments of existing contracts. 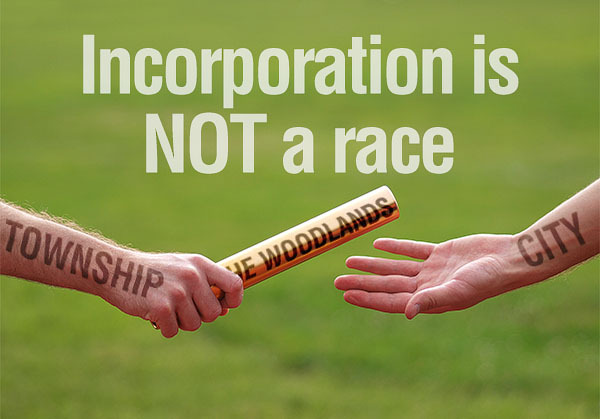 Therefore, we have over 40 years in front of us to determine the best path and time for incorporation. Traveling down this path will require some legislative changes, prudent planning by our Township and working together as a community. It's not a race! It's a commitment to keep property taxes low and to preserve The Woodlands' quality of life. As I retire from the Township Board this fall, I will advise the new members not to rush toward incorporation. There is no need and there is no benefit. Let’s keep our property taxes low. Let’s keep the Township. It is working exceedingly well.